Parking: There is a car park for guests (payable locally). The Château de Mirambeau is a historical, artistic monument and offers modern facilities at the same time. It is set within a Renaissance-style castle built on the site of an old medieval fortress. Situated on 20 acres of countryside, the property was transformed into an elegant hotel in 2002. The castle closed in 2015 for renovations, and reopened in 2016 with 18 additional guest rooms, revitalized spa, and improvements to the gardens, walkways, electronics, and media systems. 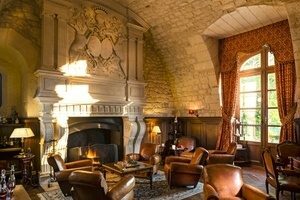 The Chateau de Mirambeau is located between Bordeaux and Cognac and therefore is the perfect based to explore both cities while enjoying a peaceful setting. Bordeaux is just an hour away by car and Cognac can be reached in 50 minutes. The Château offers a truly unforgettable experience. In addition to its beautiful setting, it has a wonderful spa with two treatment rooms. The château also boats two swimming pools, a Hammam, a jacuzzi, a sauna and a fitness room. The restaurant is one of the Château’s highlights. The Chef Maxime Deschamps proposes a fine cuisine made with local products. The hotel provides a room dedicated to wine and cognac tastings, the Cognatheque, ideal for a tasting course or to relax during the evening. This property also has an additional bar by the swimming pool, and two tennis courts. 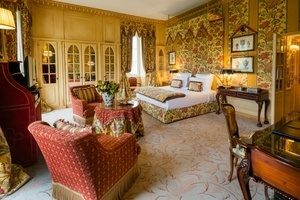 The Chateau offers 40 rooms and suites which are spread accross two buildings, the Orangerie and the Château itself. The rooms are furnished with luxurious fabrics, antique furniture and marble bathrooms. Each room boasts a unique atmosphere and an enchanting view over the park or the outdoor swimming pool. The room grades offered are Classic, Superior, Deluxe, Junior Suite, Suite and Grand Suite. They each provide all the modern amenities you would expect from 5* property, as well as preserving the traditional historic features.